"Kenworth Maska and our employees are dedicated to delivering excellent Kenworth heavy and medium duty trucks, parts and service that support customer uptime and enable fleets and truck operators to succeed in their businesses," said Pierre Letendre, president of Kenworth Maska, which operates dealerships in La Présentation, St. Mathieu de Laprairie and Sherbrooke, Quebec. 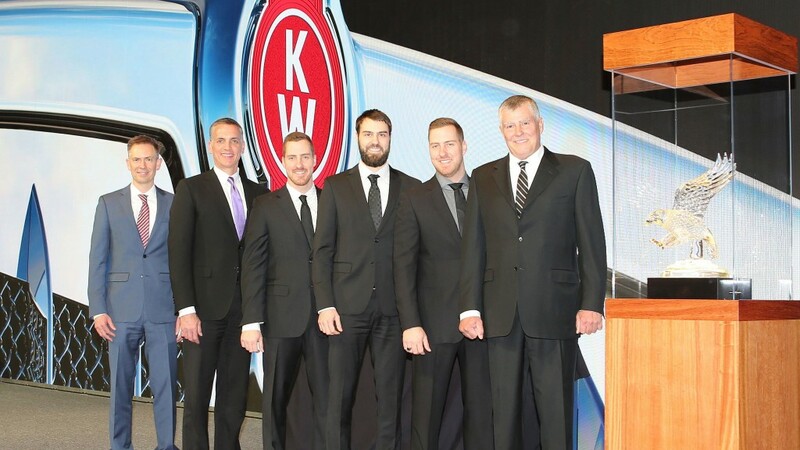 "The Kenworth dealer network family consists of outstanding dealers, which makes the Kenworth Dealer of the Year award a very special achievement and honor that we can take great pride in here in Quebec at Kenworth Maska. This is really a team effort and we want to thank each and every one of our employees at Maska for this accomplishment." "Kenworth Maska produced excellent results across our dealer excellence categories to attain nine appearances in the Kenworth Dealer Top 10 rankings," said Mike Dozier, Kenworth general manager and PACCAR vice president. "The dealer ranked high in market share, technician training, customer satisfaction, PACCAR Parts performance and growth, as well as overall facilities excellence. The commitment of Kenworth Maska to customer uptime is exemplified by its rapid response to customer roadside assistance requests from the PACCAR 365 Center, and the use of Kenworth TruckTech+ Remote Diagnostics and Kenworth TruckTech+ Service Management systems. Congratulations to The World's Best® Kenworth dealer in 2018." Kenworth also presented Gold and Silver dealer awards, as well as PACCAR Engines, Medium Duty, Parts and Service, and TRP Dealer of the Year awards. Kenworth Maska was selected as Kenworth Dealer of the Year from among Kenworth's five Gold Award winners for 2018. Other Gold Award winners are MHC Kenworth - Colorado, MHC Kenworth - Kansas City, MHC Kenworth - Oklahoma, and Wichita Kenworth. The Gold Award is presented to a select number of Kenworth dealers each year that achieve the highest level of performance in the Kenworth network. MHC Kenworth - Colorado retailed more than 1,000 new Kenworth trucks while achieving strong heavy and medium duty market share. The dealer appeared a record 14 times in the 2018 Kenworth Dealer Top 10 lists, including such key customer uptime metrics as Kenworth PremierCare Gold Certified, service hours, call center response, and parts availability. It also took first in customer service satisfaction, based on service surveys on customer satisfaction. MHC Kenworth - Kansas City earned its fifth Gold in the past decade as it retailed more than 1,000 new Kenworth trucks, while attaining impressive heavy and medium duty market share in 2018. The dealer recorded 13 Top 10 results, including customer service hours, service bay coverage, technician certifications, call center response, parts availability, and facilities excellence. MHC Kenworth - Oklahoma has now earned two Gold awards and six Silver awards in the past decade. In 2018, the dealer retailed more than 1,800 new Kenworth trucks, achieved excellent heavy duty market share and far surpassed its medium duty goal. The dealer made 10 appearances in the Top 10, including call center response, technician certification, parts availability, and fleet parts sales growth, and was first in overall facilities excellence. Wichita Kenworth earned its first Kenworth Gold to go with its four Silver awards in the past decade. The dealer retailed more than 200 new Kenworth trucks, had impressive market share and earned recognition on four "Top 10" lists, including service bay coverage, PACCAR MX engine parts growth, and Kenworth PremierCare® Gold-certified status at all four of its dealerships. Kenworth of Jacksonville; Kenworth Montréal; Kenworth Sales Company, MHC Kenworth - Arkansas; MHC Kenworth - Georgia; MHC Kenworth - Springfield; MHC Kenworth - Tennessee; MHC Kenworth - Texas; Motor Power Kenworth - Billings; Rihm Kenworth, Truckworx Kenworth - Birmingham; and Wisconsin Kenworth. MHC Kenworth - Oklahoma received Kenworth's PACCAR Engines Dealer of the Year honors. The award honors the Kenworth dealer that fully engages customers, sells all the benefits of spec'ing PACCAR MX engines, and truly meets customer uptime needs. This dealer sold nearly 900 PACCAR MX-powered units, achieved impressive market share, and made the Top 10 list in multiple categories. These included call center response, PACCAR MX technician certifications, and PACCAR MX engines sold. MHC Kenworth - Tennessee was named Kenworth Medium Duty Dealer of the Year. The award recognizes outstanding leadership and dealership focus on growing Kenworth's medium duty business. This year's winner retailed nearly 300 medium duty trucks to a diverse base of unique industries, including towing, paving, excavating, residential construction, city government, utility, petroleum, landscaping, farming, hot shot services, grocery, and local produce haulers. Truckworx Kenworth - Birmingham captured the Kenworth Parts and Service Dealer of the Year award with performances at or near the top of every major parts sales category. Truckworx was rated first in retail sales and PACCAR Parts purchase growth, plus it ranked in Kenworth's Top 5 in the outstanding facilities category. Kenworth of Indianapolis increased its TRP sales by 28 percent, overall parts purchases by 16 percent and opened a new TRP store in 2018 to help earn Kenworth TRP All-Makes Dealer of the Year honors. The award recognizes the Kenworth dealer that provides the best support for TRP all-makes parts and service. 50 years - Kenworth of Pennsylvania (Carlisle, Pennsylvania); 45 years - Youngstown Kenworth (Hubbard, Ohio); 40 years - Wisconsin Kenworth (Windsor, Wisconsin), and Truckworx Kenworth (Birmingham, Ala.); 30 Years -- Kenworth Québec (St-Nicholas, Québec), and Timmins Kenworth (Timmins, Ontario); and 25 years - Performance Kenworth (Cleveland, Texas) and Summit Kenworth (Amarillo, Texas).